Since the first launch of the Disney Cruise Line's ships in 1998 guests have been raving about the exquisite food at DCL's adults only, signature restaurant at sea, Palo. 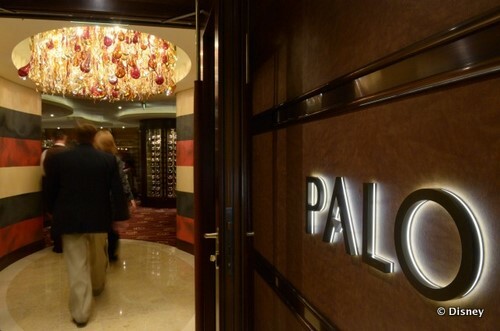 Located high atop all of the Disney Cruise Line vessels, Palo is known for it's "delectable Northern Italian cuisine, classic reserve wines and superior service". The sweeping ocean views make for a perfect setting to enjoy romantic dinners and intimate gatherings. Palo served me my favorite meal while onboard the Disney Dream. The atmosphere is cozy and welcoming, the rich interior is bathed in soft lighting and the view is simply stunning. Where other high-end restaurants may sometimes seem stuffy or intimidating, Palo's atmosphere and plentiful menu options make the dining experience comfortable while maintaining a rich elegance. "Palo's nightly culinary journey starts with both cold and antipasti selections and six different kinds of pizzas. Fresh pastas range from wild mushroom risotto to a lighter penne with fresh tomato and basil sauce and grilled shrimp. Seafoods and meats are prepared with Italian touches." 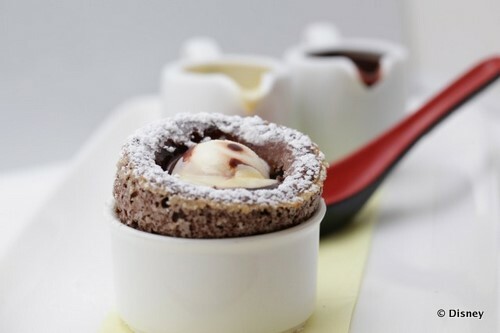 I was delighted with the sumptuous chocolate souffle I had for dessert, a dish amazingly popular with fans. On board the Disney Dream located next to Palo is the upscale adults only lounge called Meridian. Inspired by the early days of sea travel, Meridian has inside seating as well as an outside teak deck. It's an excellent place for watching a sunset or to enjoy a cigar from the assortment available at the bar. Diners at Palo are subject to a dress code, for dinner a dress shirt or jacket for men and dress or pantsuit for women" absolutely no jeans. Brunch and High Tea are less formal and dress code is categorized as "cruise casual" " meaning no jeans, shorts, swimwear or tank tops. If you're planning to embark on a Disney Cruise in the future, be sure to include reservations at this fantastic Disney dining experience. Have you already been to Palo? If so, leave me a note below saying what your favorite part of the evening was!